The protective efficacy of mAbs to Cryptococcus neoformans glucuronoxylomannan depends on Ab isotype. Previous studies in A/JCr and C57BL/6J mice showed relative protective efficacy of IgG1, IgG2a ≫ IgG3. However, we now report that in C57BL/6J × 129/Sv mice, IgG3 is protective while IgG1 is not protective, with neither isotype being protective in 129/Sv mice. IgG1, IgG2a, and IgG3 had different effects on IFN-γ expression in infected C57BL/6J × 129/Sv mice. IgG1-treated C57BL/6J × 129/Sv mice had significantly more pulmonary eosinophilia than IgG2a- and IgG3-treated C57BL/6J × 129/Sv mice. C. neoformans infection and Ab administration had different effects on FcγRI, FcγRII, and FcγRIII expression in C57BL/6J, 129/Sv, and C57BL/6J × 129/Sv mice. Our results indicate that the relative efficacy of Ab isotype function against C. neoformans is a function of the genetic background of the host and that IgG3-mediated protection in C57BL/6J × 129/Sv mice was associated with lower levels of IFN-γ and fewer pulmonary eosinophils. The dependence of isotype efficacy on host genetics underscores a previously unsuspected complex relationship between the cellular and humoral arms of the adaptive immune response. Cryptococcus neoformans is a facultative intracellular pathogen (1) that causes life-threatening infections, particularly in patients with AIDS. Cell-mediated immunity is essential for host defense (reviewed in Ref. 2), consistent with a pathogenic strategy that includes intracellular parasitism. Control of cryptococcal infection is associated with a vigorous Th1 response and granuloma formation (3, 4). However, there is evidence that Ab-mediated immunity can also make a decisive contribution to host defense (5). Several groups have shown that administration of Ab to the capsular polysaccharide can modify the course of murine cryptococcal infection to the benefit of the host (6, 7, 8, 9, 10, 11). The mechanism of Ab-mediated protection against C. neoformans appears to be extremely complex and is dependent on several variables that have historically not been associated with Ab function. For example, Ab-mediated protection against C. neoformans depends on Ab specificity (11), Ab isotype (10, 12), T cell function (9), the C. neoformans strain studied (13), Ab quantity (14), expression of inducible NO synthase 2 (NOS2)4 (15), and the presence of Th1- and Th2-related cytokines (16). Furthermore, Ab-mediated protection against murine pulmonary C. neoformans infection is accompanied by changes in the inflammatory response that reflect differences in cellular infiltrate and cytokine response (15, 17). Apart from the fundamental questions posed by the results obtained from Ab-mediated protection experiments against C. neoformans, this research has important practical considerations. Current therapy for cryptococcosis is inadequate because human disease is often incurable, especially in individuals with severely impaired immune function (18, 19). Because of the difficulties involved in the management of cryptococcosis in immunocompromised patients, passive Ab therapy is being developed for human cryptococcosis. mAbs to the glucoronoxylomannan (GXM) component of C. neoformans capsule are potential therapeutic reagents against cryptococcal infection. A mAb is currently in Phase I evaluation for the treatment of cryptococcosis (20). Studies using variable (V) region-identical Abs have shown that IgG1, IgG2a, and IgG2b prolonged survival of C. neoformans-infected mice (7, 10, 12, 21, 22, 23), whereas IgG3 was not protective in various mouse models of cryptococcal infection (11, 12, 21). Those results were interpreted as indicating that the constant (C) region class was a critical determinant of Ab efficacy against C. neoformans. The inability of IgG3 to mediate protection in most models of C. neoformans infection is perplexing since this isotype is protective in CD8−/− mice (9) and highly effective against other encapsulated pathogens (24). However, recent data suggest V region-identical Abs to C. neoformans polysaccharide can differ in specificity depending on isotype, raising questions as to whether isotype-related differences in Ab protection were due entirely to C regions differences (25). In this study, we report that IgG3, which is disease-enhancing in A/JCr and C57BL/6J mice, prolonged survival of C57BL/6J × 129/Sv mice. Furthermore, mAb IgG1 did not prolong survival in C57BL/6J × 129/Sv mice infected with C. neoformans and was disease-enhancing in 129/Sv mice. Our results show that isotype-related differences in Ab efficacy against C. neoformans pulmonary infection are a function of the genetic background of the mouse strain providing independent confirmation for the critical role of C region type in Ab protection. Strain ATCC 24067 (serotype D; American Type Culture Collection) was grown from frozen stock in Sabouraud’s dextrose broth (Difco) at 30°C for 48 h. This strain was selected because it has been extensively used in Ab studies and is well characterized (26). Inoculum was confirmed by counting CFUs on Sabouraud dextrose agar (Difco). GXM was isolated from culture supernatant of strain 24067 as described previously (27). Immune complexes were prepared in vitro by mixing 300 μg of mAb 3E5 IgG1 or IgG3 with 50 μg of GXM. The complexes were incubated for 30 min at 37°C, with mixing every 5 min. Immune complexes were injected i.v. in 200-μl volumes. mAb 2H1 (IgG1) and 3E5 (IgG1, IgG2a, IgG3), which bind the capsule polysaccharide GXM of C. neoformans, have been described elsewhere (10, 12, 21). mAbs 3E5 IgG1 and IgG2a are switch variants of the IgG3-producing murine hybridoma line. The three mAbs share the same Id and IgG1, and IgG3 were sequenced and shown to have identical V region sequences (10). Murine ascites containing mAbs was prepared by injecting hybridoma cells into the peritoneum of pristine-primed BALB/c mice. Control ascites was generated using the NSO cell line nonproducing mouse myeloma fusion partner of the hybridomas and ascites produced using these cell lines were used in some experiments. For some experiments, mAb 3E5 (IgG1, IgG2a, IgG3) was purified from ascites fluid using protein G affinity chromatography (Pierce) as instructed by the manufacturer, and PBS was used as the control. Breeding pairs of control C57BL/6J × 129/Sv mice (gift from Dr. C. Nathan, (Weill Medical College of Cornell University, New York, New York) were maintained at the Animal Institute of Albert Einstein College of Medicine. Female A/JCr, 129/Sv, C57BL/6J, and additional C57BL/6J × 129/Sv were obtained from The Jackson Laboratory. In all experiments, mice were used at 6–8 wk of age. Mice were housed in sterile microisolator cages in a barrier environment and were maintained in a specific pathogen-free barrier facility in microisolator cages, fed irradiated rodent food, provided with autoclaved bedding, and routinely monitored for serologic evidence of exposure to common murine pathogens. All serological testing was negative. For peritoneal macrophage isolation, the abdominal cavities of euthanized mice were lavaged five times with sterile HBSS using a Pasteur pipette. The lavage fluids were pooled, cells were collected by centrifugation, and erythrocytes were lysed by incubating the cell preparation in 0.17 M NH4Cl for 10 min in ice. A 10-fold excess of DMEM (Invitrogen Life Technologies) solution was added to make the solution isotonic and the cells were collected by centrifugation and suspended in DMEM containing 10% NCTC-109 (Life Technologies), 10% FBS (Gemini Bioproducts), and 1% nonessential amino acids (Mediatech). Live cells (based on trypan blue exclusion) were counted in a hemocytometer chamber. For phagocytosis and killing assays, the cells were plated at a density of 8 × 104 cells/well in 96-well tissue culture plates and incubated overnight at 37°C. The protocols for macrophage phagocytosis and killing assays have been described previously (23). Briefly, macrophages were stimulated with 100 U/ml IFN-γ (Boehringer Mannheim) and 1 μg/ml LPS (Sigma-Aldrich). Phagocytosis was measured in medium with or without 10 μg of mAb. C. neoformans cells were added at a macrophage:yeast ratio of 5:1 and the suspensions were incubated at 37°C for 2 h. The macrophage monolayer was then washed several times with sterile PBS, fixed with cold absolute methanol, and stained with a 1/20 solution of Giemsa. The phagocytic index was determined by microscopic examination at a magnification of ×600. The phagocytic index is the number of attached and ingested cryptoccocci divided by the number of macrophages per field. Four fields were counted in 4 wk for each measurement. For killing assays, activated macrophages and C. neoformans cells were coincubated for 24 h at 37°C. Cell supernatants were collected and cells were lysed by addition of 100 μl of sterile distilled water to each well and incubated for 30 min at room temperature, followed by aspirating and ejecting the lysate several times to complete cell disruption. Nitrite (28) and oxidative burst (29) were measured using Griess reagent (1% sulfanilamide, 0.1% N-1-napthylethylenediamine, 2.5% phosphoric acid) and luminol (cyclic hydrazide 5-amino-2,3-dihydro-1,4-phthalazinedione, respectively, in cell supernatant collected from killing assays. A/JCr, 129/Sv, and C57BL/6J × 129/Sv mice were infected i.v. and/or intratracheally (i.t.) as previously described (7, 23). For i.t. infections, A/JCr, 129/Sv, and C57BL/6J × 129/Sv mice were anesthetized with ketamine (10 mg/kg) and xylazine (125 mg/kg) in PBS. Mice received 106 yeast cells i.t. in 50 μl of PBS. Intravenous infections were done by injecting 105 yeast cells in 100 μl of PBS into the tail vein of A/JCr and C57BL/6J × 129/Sv mice. mAbs (1 mg) in ascites were administered i.p. 24 h before infection. Mice were monitored daily for mortality. All animal work was done in accordance with regulations of the Institute for Animal Studies at Albert Einstein College of Medicine. C57BL/6J × 129/Sv mice (6–8 wk old) were infected as described above. Experimental groups were given purified mAb 3E5 IgG1, IgG2a, IgG3, or PBS i.p. 24 h before infection with yeast. Sham-infected groups were given mAb 3E5 IgG1, IgG2a, IgG3 or PBS i.p. 24 h before i.t. administration of PBS. Blood was obtained from the orbital sinus and serum was isolated by centrifugation of blood and stored at −20°C until tested. Mice were sacrificed at day 14 after infection and the right lungs were homogenized in 2 ml of PBS in the presence of protease inhibitors (Complete Mini; Boehringer Mannheim). The homogenates were centrifuged at 6000 × g for 10 min. and the supernatant was frozen at −80°C until tested. The supernatants were assayed for concentration of IL-2, IL-4, IL-6, IL-10, IL-12p70, MCP-1, and MIP-1α by ELISA (BD Pharmingen and R&D Systems). The detection limits of cytokine assays are 3.1 pg/ml for IL-2, 7.8 pg/ml for IL-4, 15.6 pg/ml for IL-6 and TNF-α, 31.3 pg/ml for IL-10 and IFN- α, and 62.5 pg/ml for IL-12p70 as determined by the manufacturer. The detection limits of the chemokine assays are 4.7 pg/ml for MIP-1α and 15.6 pg/ml for MCP-1 as determined by the manufacturer. The serum was assayed for IgE concentrations using the ELISA as described by the manufacturer (BD Pharmingen). For the cytokine and cellular response experiments, great care was taken to avoid contamination with endotoxin. One person did all work involving purification of mAb reagents and handling of reagents in a laminar flow hood. Solutions were made with endotoxin-free water or PBS. Extensive use was made of disposable pyrogen-free plastic ware, pipettes, pipet tips, microcentrifuge tubes, etc. Endotoxin concentration in mAb solutions measured by Limulus amoebacyte assay (BioWhittaker) was below the limit of detection of the assay. At day 14 after infection, lungs were excised, minced, homogenized using a sterile 70-μm nylon mesh (BD Biosciences), and digested for 60 min using 10 ml/lung digestion buffer: RPMI 1640, 10% FCS, 1 mg/ml collagenase (Boehringer Mannheim) and 30 μg/ml DNase I (Sigma-Aldrich). The total cell suspension was collected by centrifugation; erythrocytes were lysed by resuspending in ice-cold 0.17 M NH4Cl on ice for 10 min. A 10-fold excess of RPMI 1640 solution was then added to make the solution isotonic, the cells were collected by centrifugation and suspended in staining solution (PBS and 1% FBS), and live cells (based on trypan blue exclusion) were counted in a hemocytometer chamber. Neutrophils, eosinophils, lymphocytes, and monocyte/macrophages were counted from Giemsa-stained samples of lung cell suspensions centrifuged onto glass slides (Shandon Cytospin). Approximately 200–400 cells were counted from randomly chosen high-power microscope fields for each sample. For FACS, lung leukocytes (106) were stained for 30 min on ice with 100 μl of one of the following Abs diluted in staining buffer: 2 μg/ml R-PE-labeled anti-CD45, 5 μg/ml FITC-labeled anti-mouse CD4, 2 μg/ml CyChrome-labeled anti-mouse CD8, 5 μg/ml FITC-labeled anti-mouse CD19, and 5 μg/ml FITC-labeled anti-mouse MAC-3 (all mAbs from BD Pharmingen). The samples were washed twice in staining buffer and fixed in 1% paraformaldehyde. Stained samples were stored in the dark at 4°C until analyzed on Calibur FACScan flow cytometer (BD Biosciences) using CellQuest (BD Biosciences) software. CD45+ cells within the appropriate forward and side scatter gates were analyzed. Controls consisted of isotype-matched irrelevant Abs. C57BL/6J, 129/Sv, and C57BL/6J × 129/Sv mice were infected as described above. Experimental groups were given purified mAb 3E5 IgG1, IgG3, or PBS 24 h before infection. Mice were sacrificed at day 14 after infection, lungs were removed, and total RNA was isolated using TRIzol reagent (Invitrogen Life Technologies) following the manufacturer’s instructions. Mice were sacrificed at day 14 after infection, lungs were removed, and total RNA was isolated using TRIzol reagent (Invitrogen Life Technologies) following the manufacturer’s instructions. For the experiments involving immune complexes, mice were injected i.v. with either PBS/GXM, IgG1/GXM, or IgG3/GXM and sacrificed 2 h later. Spleens were removed and total RNA was isolated using TRIzol reagent. The concentration of the total RNA was determined using an Ultraspec 2000 UV/Visible spectrophotometer (Pharmacia Biotech). cDNA was made with the Superscript II kit (Invitrogen Life Technologies) following the manufacturer’s instructions. Parallel samples without reverse transcriptase (RT−) were prepared as control. Real-time PCR was performed in 384-well Clean Optical Reaction Plates (Applied Biosystems), each well containing SYBR green PCR Master Mix (Applied Biosystems), cDNA, and a pair of oligonucleotides specific for each gene (Table I⇓). The PCR was performed in an ABI Prism 7900 HT Sequence Detection System using the following cycles: 10 s at 95°C, 90 s at 60°C, and 30 s at 72°C. This cycle was repeated 40 times. The results were analyzed with the SDS 2.0 software (Applied Biosystems). The mRNA levels of the housekeeping gene encoding β2-microglobulin and hypoxanthine phosphoribosyltransferase (Table I⇓) were measured and used to normalize the data. All data were analyzed by the Student t test, one-way ANOVA, and Kruskal-Wallis test (Primer; McGraw-Hill, New York, NY) and log rank analysis (Sigmastat, Chicago, IL). Previous studies showed that mAbs 2H1 (IgG1) and 3E5 (IgG3) were consistently protective and nonprotective in murine models of systemic and pulmonary C. neoformans infection using both A/JCr and C57BL/6J mice (7, 11, 23). While investigating the role of NO and the efficacy of these mAbs against pulmonary cryptococcal infection (15), we noted that mAb 3E5 IgG3-treated C57BL/6J × 129/Sv mice infected i.t. with C. neoformans survived longer than mAb 2H1 IgG1-treated C57BL/6J × 129/Sv mice (p = 0.049; median survival of 100 and 21 days, respectively) (Fig. 1⇓A). To establish whether this result was due to Ab protection in pulmonary infection, we studied the ability of mAbs 2H1 (IgG1) and 3E5 (IgG3) against i.v. infection in C57BL/6J × 129/Sv mice and found that the IgG3 was again protective (Fig. 1⇓B). Given the surprising result that IgG3 was protective in C57BL/6J × 129/Sv mice, we repeated the studies in A/JCr mice to ascertain that the original findings of IgG1 (protective) and IgG3 (nonprotective) in that strain were reproducible. As expected, the experiments in A/JCr mice revealed that IgG1 prolonged survival and IgG3 did not (data not shown). Next, we considered the possibility that a subtle difference in the specificity of mAbs 2H1 and 3E5 was responsible for the discrepancy between the results in A/JCr and C57BL/6J mice and C57BL/6J × 129/Sv mice. Hence, we repeated the study with a 3E5 IgG3 and a V region-identical isotype switch variant, 3E5 IgG1. mAb 3E5 IgG3-treated C57BL/6J × 129/Sv mice survived longer than mAb 3E5 IgG1-treated C57BL/6J × 129/Sv mice (p = 0.03; median survival of 216 and 41 days, respectively) (Fig. 1⇓C). In summary, IgG3, but not IgG1, consistently protected C57BL/6J × 129/Sv mice against C. neoformans infection. We then examined the survival of C. neoformans-infected 129/Sv mice treated with mAbs 3E5 IgG1 and IgG3 to determine its efficacy in one of the parental strain. Administration of IgG1 did not confer protection in 129/Sv mice (p < 0.05; median survival of 13 days) compared with IgG3- and control-treated mice (Fig. 1⇓D). Administration of IgG3 had no effect on survival (p = 0.69). The isotype-related differences in Ab-mediated protection with the various strains are summarized in Table II⇓. A, Survival of C57BL/6J × 129/Sv mice following i.t. infection with 106 C. neoformans. mAb 3E5 IgG3 vs mAb 2H1 IgG1: p = 0.049; n = 10 for each Ab group. B, Survival of C57BL/6J × 129/Sv mice following i.v. infection with 105 C. neoformans ATCC strain 24067. mAb 3E5 IgG3 vs mAb 2H1 IgG1: p = 0.043; n = 8 for each Ab group. Legend applies to A and B. C, Survival of C57BL/6J × 129/Sv mice given mAbs 3E5 IgG1 and IgG3, which share the same V regions. Mice were infected i.t. with 106 C. neoformans ATCC strain 24067. mAb 3E5 IgG3 vs mAb IgG1: p = 0.03; n = 10 for each Ab group. D, Survival of 129/Sv mice infected i.t. with 106 C. neoformans. mAb 3E5 IgG3 vs IgG1: p < 0.001; n = 10 for each Ab group. Legend applies to C and D. In all experiments, mice were 6–8 wk of age. We investigated the ability of peritoneal macrophages isolated from C57BL/6J, 129/Sv, and C57BL/6J × 129/Sv to phagocytose and kill C. neoformans. There were no differences in phagocytosis of yeast cells by C57BL/6J, 129/Sv, and C57BL/6J × 129/Sv peritoneal macrophages (p = 0.914). The phagocytic indices were significantly higher in the mAb-treated groups for C57BL/6J, 129/Sv, and C57BL/6J × 129/Sv peritoneal macrophages (p < 0.05) but no differences were seen between isotypes (data not shown). Incubation of peritoneal macrophages with C. neoformans cells and mAb treatment resulted in reduction in CFUs after 24 h in C57BL/6J, 129/Sv, and C57BL/6J × 129/Sv peritoneal macrophages. A greater reduction of CFUs was noted for C57BL/6J × 129/Sv peritoneal macrophages but no differences in the magnitude of the effect were observed between IgG1 or IgG3 (Fig. 2⇓A). To demonstrate that peritoneal macrophages produced NO and oxidative burst during the killing assay, nitrite levels and oxidative burst were measured. Administration of IgG1 and IgG3 enhanced production of NO which correlated with the reduction of CFUs. Higher nitrite levels were noted in C57BL/6J × 129/Sv peritoneal macrophages compared with those from C57BL/6J and 129/Sv mice (Fig. 2⇓B). No differences were noted in the oxidative burst from peritoneal macrophages from C57BL/6J, 129/Sv, and C57BL/6J × 129/Sv mice irrespective of mAb treatment (data not shown). A, Interaction of C. neoformans with murine peritoneal macrophages from C57BL/6J, 129/Sv, and C57BL/6J × 129/Sv mice in the presence and absence of IgG1 or IgG3. ∗, Values with IgG1 and IgG3 are significantly different relative to conditions with no mAb. B, Nitrite levels in the supernatant of peritoneal macrophages from C57BL/6J, 129/Sv, and C57BL/6J × 129/Sv mice. ∗, Values were significantly different relative to conditions with no mAb and/or C. neoformans. Nitrite levels were detected using the Griess assay. These experiments were done twice with similar results. Bars denote the average of measurements from four wells. Since Ab-mediated protection against C. neoformans in the lung is associated with quantitative differences in the cytokine, chemokine, and cellular composition of the response (17), we measured cytokines and chemokine levels in the lungs of infected C57BL/6J × 129/Sv in the presence and absence of identical 3E5 IgG1, IgG2a, or IgG3. For these sets of experiments, we included IgG2a because this isotype has been shown to protect C. neoformans-infected A/JCr mice (10). Furthermore, since IgG3 and IgG2a interact primarily with FcγRI, whereas IgG1 interacts primarily with FcγRIII, the inclusion of IgG2a provided an additional Ab-treated group to analyze whether the effects were solely from interaction with different Fc receptors. Since mAb is rapidly consumed in the setting of cryptococcal infection and is gone by day 14, we reasoned that day 14 was an appropriate time point for our analysis of cytokine and chemokine protein expression. In addition, we believe that host damage seen in this system is a result of the inflammatory response (15) and day 14 allows the study of an early adaptive immune response before immune-mediated damage. At day 14 after infection, C57BL/6J × 129/Sv mice infected with C. neoformans had significantly higher levels of IL-6, IFN-γ, MCP-1, and MIP-1α than sham-infected mice (Table III⇓ and Fig. 3⇓). Interestingly, C. neoformans infection was associated with lower levels of IL-2 than found in sham-infected mice (Table III⇓). Administration of IgG1, IgG2a, or IgG3 before infection affected the levels of certain cytokines and chemokines (Table III⇓ and Fig. 3⇓). The average concentration of IFN-γ in the lungs of infected mice receiving IgG1 or IgG2a was significantly higher than in sham-infected controls (Fig. 3⇓). Notably, infected C57BL/6J × 129/Sv mice given mAb IgG3 had lower IFN-γ levels (p = 0.008) than mice receiving IgG1 or IgG2a (Fig. 3⇓). Furthermore, IgG3-treated mice had higher levels of IL-4 and IL-12 than IgG1 and IgG2a-treated mice (Table III⇓). Differences in cytokine and chemokine expression in lung of infected C57BL/6J × 129/Sv mice. Cytokine and chemokine levels were measured by ELISA at day 14 after infection. Bars denote mean protein concentration. V region-identical 3E5 mAb IgG1, IgG2a, and IgG3 were used in these experiments. Mouse groups: PBS/CN, mAbs IgG1/CN, IgG2a/CN, and IgG3/CN: n = 6; PBS/PBS, IgG1/PBS, IgG2a/PBS, and IgG3/PBS: n = 3. Error bars denote SDs. 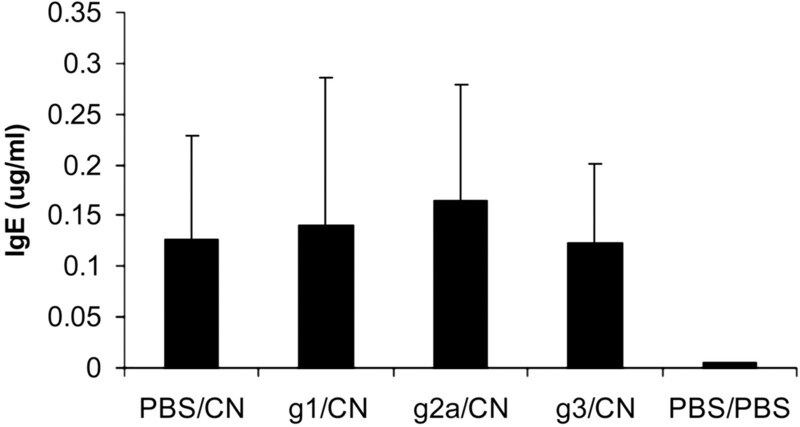 Upper panel, IFN-γ; ∗, values are significantly different compared with PBS/CN, mAb IgG1/CN, and IgG2a/CN. Middle and lower panels, MCP-1 and MIP-1α; ∗, values are significantly different compared with PBS/CN, mAbs IgG1/CN, and IgG3/CN. Values of p < 0.05 are considered to be significant. Serum IgE levels were measured in infected C57BL/6J × 129/Sv in the presence and absence of identical 3E5 IgG1, IgG2a, or IgG3. C57BL/6J × 129/Sv mice infected with C. neoformans had significantly higher concentrations of IgE compared with sham-infected mice (Fig. 4⇓). In contrast, we found no differences in IgE levels in PBS- and mAb-treated C57BL/6J × 129/Sv mice infected with C. neoformans (Fig. 4⇓). Effect of mAb on serum IgE level of C57BL/6J × 129/Sv mice infected with C. neoformans. IgE levels were measured by ELISA at day 14 after infection. V region-identical 3E5 mAb IgG1, IgG2a, and IgG3 were used in these experiments. Mouse groups: PBS/CN, mAbs IgG1/CN, IgG2a/CN, and IgG3/CN: n = 6; PBS/PBS, IgG1/PBS, IgG2a/PBS, and IgG3/PBS: n = 3. Error bars denote SDs. ∗, Values are significantly different compared with PBS/CN, mAb IgG1/CN, IgG2a/CN, and IgG3/CN. Lung weights, which reflect the magnitude of the inflammatory response, GXM deposition, and organ edema were similar in infected C57BL/6J × 129/Sv mice irrespective of Ab treatment (Fig. 5⇓A). We found no differences in the total number of cells recruited to the lung of C57BL/6J × 129/Sv mice treated with IgG1 compared with that of controls. Significantly higher numbers of cells were recruited into the lungs of IgG2a- and IgG3-treated mice compared with control-treated mice (p < 0.001; Fig. 5⇓B). On day 14 after infection, FACS analysis of lung cells showed a higher percentage of lymphocytes and macrophages in the inflammatory infiltrate of mAb-treated C57BL/6J × 129/Sv mice compared with sham-infected C57BL/6J × 129/Sv mice (Fig. 5⇓C). Analysis of granulocyte composition revealed significant differences in the proportion of eosinophils in the inflammatory response of C57BL/6J × 129/Sv mice. The inflammatory infiltrate in mAb IgG1-treated C57BL/6J × 129/Sv mice demonstrated a trend toward more eosinophils than IgG2a-treated and IgG3-treated C57BL/6J × 129/Sv mice (p = 0.057; Fig. 5⇓D). We analyzed the occurrence of apoptotic cell death quantitatively by the TUNEL procedure on lung tissue sections from C57BL/6J × 129/Sv mice infected with C. neoformans and treated with IgG1, IgG3, or PBS. We noted very few TUNEL-positive cells in the lungs of infected mice irrespective of mAb treatment (data not shown). Characterization of inflammatory response of C. neoformans-infected C57BL/6J × 129/Sv mice 14 days after infection. V region-identical 3E5 mAb IgG1, IgG2a, and IgG3 were used in the experiments. A, Lung weights of infected mice. Bars denote mean organ weight. Lung weights for all infected groups were significantly increased compared with the sham control group. B, Total number of cells that infiltrated the lungs of infected mice. Bars denote mean total lung cells. 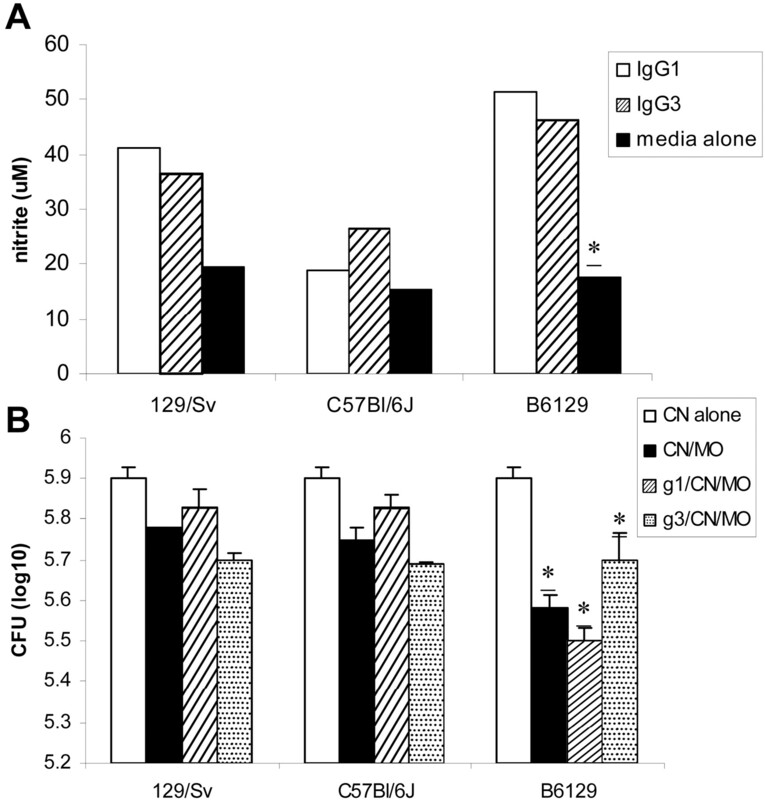 ∗, Values are significantly different from control-treated C57BL/6J × 129/Sv mice (p < 0.05). C, FACS analysis of infiltrating pulmonary B cells, T cells, and macrophages. Bars denote mean percentage. ∗,Values are significantly different from mAbs IgG1, IgG2a, and IgG3-treated C57BL/6J × 129/Sv mice (p < 0.05). D, Morphological analysis of pulmonary macrophages/monocytes, lymphocytes, neutrophils, and eosinophils from infected C57BL/6J × 129/Sv mice. ∗, Values are significantly different compared with control- and mAb IgG1-treated mice (p = 0.057). Mouse groups: sham: n = 3; control and mAbs IgG1, IgG2a, and IgG3: n = 6. Error bars denote SDs (applies to all panels). Since FcγR polymorphisms differ in affinity for IgG subclasses (30), we measured FcγR levels in the lungs of infected C57BL/6J, 129/Sv, and C57BL/6J × 129/Sv in the presence and absence of identical 3E5 IgG1, IgG3, and control-treated mAb by real-time PCR (Table IV⇓). At day 14 after infection, we measured differences in FcγR expression in the different mouse strains infected with C. neoformans and treated with mAb. IgG1-treated C57BL/6J mice exhibited a 0.5-fold decrease in FcγRI expression, whereas IgG3-treated mice had a 6-fold increase in FcγRI expression. Subtle changes in FcγRIIb and FcγRIII expression were seen in IgG1- and IgG3-treated C57BL/6J mice. IgG1 and IgG3 treatment had little effect on FcγRI and FcγRIIb expression in 129/Sv mice. Inversely, mAb IgG1- and IgG3-treated 129/Sv mice exhibited a 3- and 9-fold increase, respectively, in FcγRIII expression. Interestingly, mAb treatment had little effect on FcγR expression in C57BL/6J × 129/Sv mice. To investigate whether the differences in FcγR expression were due to infection, differences in cell recruitment or Ag-Ab complex stimulation, we infused preformed IgG1 and IgG3 complexes and measured receptor expression in spleen cells 2 h later. FcγR levels in the spleen of C57BL/6J, 129/Sv, and C57BL/6J × 129/Sv mice were measured in the presence and absence of 3E5 IgG1 or IgG3 complexed to GXM by real-time PCR (Table V⇓). IgG1-treated C57BL/6J mice exhibited 0.5- to 1- and 2-fold increase in FcγRI and FcγRII expression, respectively. IgG3-treated C57BL/6J mice exhibited 2- and 6-fold increase in FcγRI and FcγRIII expression. IgG1 and IgG3 treatment had little effect on FcγR expression in 129/Sv mice. mAb IgG1- and IgG3-treated C57BL/6J × 129/Sv mice exhibited a 3- and 2- fold increase in FcγRI expression, respectively. Ten- and 7-fold increases in FcγRIII expression were noted in IgG1- and IgG3-treated C57BL/6J × 129/Sv mice, respectively. Subtle changes were noted in FcγRIIb expression in IgG1- and IgG3-treated C57BL/6J × 129/Sv mice. We report that administration of IgG3 prolonged survival in C57BL/6J × 129/Sv mice, whereas administration of IgG1 had either no effect or enhanced infection. This result was unexpected since mAb IgG3 has consistently been ineffective in mediating protection in various murine models of cryptococcal infection (11, 12). However, the results can be understood if one considers three separate previous observations: 1) that susceptibility to C. neoformans infection varies depending on the genetic background of the host (31, 32); 2) that resistance to C. neoformans is a function of the type of immune response (33, 34); and 3) that Ab efficacy is dependent on cell-mediated immunity (9, 15). Yuan et al. (12) demonstrated that switching the isotype of 3E5 IgG3 mAb to IgG1 converted a nonprotective Ab to a protective Ab when administered before i.v. infection in C57BL/6J mice. Subsequent studies established that IgG1 was not protective in the absence of CD4+ T cells, whereas both IgG1 and IgG3 were protective in mice lacking CD8+ T cells (9). The different results obtained with both IgG1 and IgG3 in mice with defective T cell function established that the protective efficacy of Ab was dependent on the cellular immune response. Similarly, IgG1 was not protective in NOS2−/− mice, presumably because it could not mediate protection with the type of inflammatory response made in the absence of NO (15). Mice treated with IgG1 mice had better organized granulomatous inflammation to C. neoformans infection (23). Together, these observations imply that Ab efficacy is mediated by, and dependent on, cell-mediated immunity. Mechanisms by which Ab can affect a cell-mediated response include enhanced Ag presentation, changes in cytokine expression as a result of FcR activation, and increased expression of costimulatory molecules (35). Additional evidence for the dependence of IgG3 efficacy on other components of the immune system came from studies in complement-deficient mice, which showed that the disease-enhancing effect of IgG3 in C57BL/6J mice is dependent on the presence of C3 (36). To investigate the mechanism for isotype-related differences observed in passive Ab experiments in different mouse strains, we analyzed the inflammatory response in C57BL/6J × 129/Sv in the presence and absence of IgG1, IgG2a, or IgG3. Although IgG2a was not used in survival studies, it was evaluated in some assays because it behaves like IgG1 with regard to Ab-mediated effects against C. neoformans (10). Ab-mediated protection did not correlate with macrophage phagocytic or killing efficacy or with the percentage of apoptotic cells in vivo. In addition, IgG1 and IgG3 treatment resulted in similar NO production and oxidative burst measurements in vitro. Qualitative analysis of the lung infiltrate of infected C57BL/6J × 129/Sv mice revealed similar numbers of CD4, CD8, and macrophages in the presence and absence of Ab, but Ab treatment increased the number of B lymphocytes, supporting the role of B cells in protection against C. neoformans. In addition, there were significantly more eosinophils in the lungs of control and IgG1-treated mice than in IgG2a- or IgG3-treated mice. Eosinophilia is considered a nonprotective inflammatory response for C. neoformans infection in mice (37). Eosinophils contain granules that produce polycationic proteins that are highly toxic to several pathogens, including C. neoformans (38, 39). However, these proteins also have the potential to harm mammalian cells, including respiratory epithelial cells (40, 41). Other mechanisms by which eosinophils can cause damage include generating superoxide radicals and leukotrienes, which are toxic to both C. neoformans and mammalian cells (reviewed in Refs. 23 and 42) and brominating proteins (43). The eosinophilia in the inflammatory response of control and IgG1-treated C57BL/6J × 129/Sv mice may account for their shorter survival relative to IgG3-treated mice as a consequence of increased eosinophil-mediated lung damage. The differences in protective efficacy between IgG3 and IgG1 are striking. Despite identical V regions, there is evidence that these isotypes form different types of Ag-Ab complexes when complexed to GXM. In this regard, IgG3 binds Ags to repeating epitopes with higher avidity as a result of Ab Fc-Fc interactions (44) and may form different types of complexes with the capsule of C. neoformans than those formed by IgG1 (45). However, differences in fine specificity cannot explain why the same isotype differs in protective efficacy in different mouse strains. In fact, the differences in protective efficacy observed for IgG1 and IgG3 in mice of different genetic background provides independent confirmation that the C region class is a critical determinant of Ab efficacy in this system. Three different classes of murine Fc receptors for IgG have been identified on immune effector cells: FcγRI, FcγRII, and FcγRIII (46, 47). It has been suggested that both murine IgG1 and IgG2b interact preferentially with the low-affinity receptors FcγRII and FcγRIII and IgG2a and IgG3 with the affinity receptor FcγRI (46). FcγR polymorphisms have been identified that may affect receptor affinity for IgG subclasses and the efficiency of the cellular immune response (30). In our studies, we compared IgG1 and IgG3 that bind primarily FcγRIII and FcγRI, respectively (48). Analysis of FcγRI, FcγRIIb, and FcγRIII expression at day 14 of infection reveal that each of the three mouse strains analyzed in this study responded differently to IgG1 and IgG3 administration. In strains C57BL/6J and 129/Sv mice, large (6- to 9-fold) changes in FcγRI or FcγRIII expression were observed that may be associated with lack of Ab protection (e.g., IgG3 in C57BL/6, IgG1 and IgG3 in 129/Sv). Higher expression of the proinflammatory FcγRI or FcγRIII in these strains could have adversely affected the outcome of infection by promoting inflammatory damage. In contrast, IgG1- and IgG3-mediated protection in C57BL/6 and C57BL/6J × 129/Sv mice, respectively, was associated with relatively small changes in FcγR expression. In fact, for C57BL/6J × 129/Sv mice, both IgG1 (nonprotective) and IgG3 (protective) produced the same qualitative small changes in receptor expression, indicating that this effect was unlikely to be solely responsible for the differences in protective efficacy. Nonetheless, there is evidence that mouse strain-dependent differences in susceptibility for autoimmune disease correlate with Fc receptor polymorphism (49, 50) Our results show for the first time that Ab administration can have profound effects on FcγR expression in certain hosts. Changes in FcγR expression could be measured 2 h after injection of preformed Ag-Ab complexes, indicating that this effect did not require an active infection and suggesting that it may be mediated by stimulation of FcγR. The observation that IgG administration can alter FcγR expression has not been previously described and its occurrence introduces additional complexity into this system. Hence, passive Ab is not only changing the inflammatory response through its effects on FcγR but also altering the potential responsiveness of tissue to Ab by changing FcγR expression. IgG2a- and IgG3-treated mice had different cytokine responses to C. neoformans infection. Since IgG2a and IgG3 bind the same Fc receptor, FcγRI (48, 51), this result implies that mechanisms other than Fc receptor activation contribute to this effect. The lungs of C57BL/6J × 129/Sv mice infected with C. neoformans had higher levels of IFN-γ, MIP-1α, and MCP-1 than those from sham-infected mice consistent with an inflammatory response to C. neoformans infection (52, 53, 54). Interestingly, IL-2 levels were lower in C. neoformans-infected mice than in sham-infected mice, suggesting down-regulation of this important cytokine (55). Ab treatment had different effects on cytokine production in C57BL/6J × 129/Sv mice depending on the Ab isotype. mAb IgG3-treated mice had lower levels of IFN-γ and higher levels of IL-2 and IL-4. Although the mechanism for this effect is not understood, Ab-mediated protection has been associated with lower levels of IFN-γ in A/JCr mice (17). Although Th1 responses are critical for an effective host response against C. neoformans in mice (33, 34, 37, 56, 57), Th2-related cytokines are also necessary for Ab function (16). In other systems, there is evidence that disproportionately strong Th1 responses can result in reduced survival as a consequence of increased tissue damage (15, 58, 59, 60) and it is possible that this also occurs in murine pulmonary cryptococcosis. We note that Ab treatment had no significant effect on IgE levels, suggesting that the polarity of the Th1/Th2 response in the presence and absence of Ab was similar. IFN-γ appears to be beneficial or harmful depending on its tissue level and is likely to have a critical role in the mechanisms that determine either early death or survival in C57BL/6J × 129/Sv mice. The combination of higher levels of IL-4 and lower levels of IFN-γ in IgG3-treated mice could have enhanced the efficacy of the immune response by simultaneously promoting a strong Th1 response while blunting the intensity of the inflammatory response and, consequently, prolonging survival by reducing lung damage. The inflammatory response to C. neoformans infection in the presence of IgG1 has now been studied in four mouse strains where IgG1 prolongs survival in A/JCr (12, 21) and C57BL/6J mice (61) but not in NOS2−/− (15) and C57BL/6J × 129/Sv mice (this study). Comparison of the effect of IgG1 on Th1 cytokines reveals that Ab administration had little effect on IL-2 levels in all strains studied. For IFN-γ, Ab administration was accompanied by lower levels in A/JCr (protection) and NOS2−/− (no protection) and higher levels in C57BL/6J (protection) and C57BL/6J × 129/Sv (no protection). Hence, there does not appear to be a consistent pattern between changes in Th1 cytokine levels and Ab-mediated protection between different mouse strains. However, Ab administration, in the form of IgG1 or IgG3, was associated with higher levels of IL-4 and/or IL-10 in the three mouse strains where it has mediated protection, namely, A/JCr (10, 62), C57BL/6J (61, 63), or C57BL/6J × 129/Sv (this study). In this regard, FcR activation by Ag-Ab complexes increases IL-10 expression (64). Thus, it is possible that Ab-mediated protection against C. neoformans infection occurs, at least in part, through promoting higher levels of Th2-related cytokines in the setting of granulomatous inflammation, which presumably reflects a Th1-polarized response (65). Higher levels of Th2-associated cytokines could be expected to moderate the Th1 response and possibly reduce host-mediated tissue damage. These results are consistent with the proposal that, for some infections, the presence of specific Ab may function to down-regulate the cell-mediated immune response (66). In summary, we demonstrate that isotype-related differences in Ab efficacy against C. neoformans are dependent on the mouse strain studied. A previous study using polyclonal sera to Legionella pneumophila reported that passive immunization was protective in genetically resistant but not susceptible mouse strains (67). That result was interpreted as reflecting mouse strain-related differences in the macrophage efficacy for Ab-opsonized bacteria. Thus, dependence of Ab efficacy on host genetics may be a general phenomenon applicable to many pathogenic microbes and indicates an additional consideration in interpreting the results of Ab-passive experiments. Furthermore, we demonstrate that the inflammatory response, as defined by cellular composition and cytokine/chemokine tissue levels, can differ depending on the isotypes of Ab present. Our findings add to the increasing body of evidence that Ab-mediated protection against C. neoformans infection is a result of subtle effects on the immune response that may increase its efficacy against this pathogen and reduce immune-mediated damage to the host. We thank John MacMicking (Cornell University), Carl Nathan (Cornell University), John Mudgett (Merck Research Laboratories, West Point, PA), and Louis M. Weiss (Albert Einstein College of Medicine, Bronx, NY) for providing us with the C57BL/6J × 129/Sv mice. We thank Carlos P. Taborda for his invaluable help with experiments. ↵1 J. R. is supported by Immunooncology Training Grant 5-T32-CA 09173. A. C. is supported by National Institutes of Health Awards AI33774, AI3142, and HL-59842. ↵2 The data in this article are from a thesis submitted by J. R. in partial fulfillment of the requirements of the degree of doctor of philosophy in the Sue Golding Graduate Division of Medical Science, Albert Einstein College of Medicine, Yeshiva University, Bronx, NY. ↵4 Abbreviations used in this paper: NOS2, NO synthase 2; i.t., intratracheal; GXM, glucoronoxylomannan, V, variable region; C, constant region. Feldmesser, M., Y. Kress, P. Novikoff, A. Casadevall. 2000. Cryptococcus neoformans is a facultative intracellular pathogen in murine pulmonary infection. Infect. Immun. 68: 4225-4237. Pirofski, L. A., A. Casadevall. 1996. Cryptococcus neoformans: paradigm for the role of antibody immunity against fungi?. Zentrabl. Bakteriol. 283: 475-495. Huffnagle, G. B., G. B. Toews, M. D. Burdick, M. B. Boyd, K. S. McAllister, R. A. McDonald, S. L. Kunkel, R. M. Strieter. 1996. Afferent phase production of TNF-α is required for the development of protective T cell immunity to Cryptococcus neoformans. J. Immunol. 157: 4529-4536. Goldman, D. L., A. Casadevall, Y. Cho, S. C. Lee. 1996. Cryptococcus neoformans meningitis in the rat. Lab. Invest. 75: 759-770. Vecchiarelli, A., A. Casadevall. 1998. Antibody-mediated effects against Cryptococcus neoformans: evidence for interdependency and collaboration between humoral and cellular immunity. Res. Immunol. 149: 321-333. Dromer, F., J. Charreire, A. Contrepois, C. Carbon, P. Yeni. 1987. Protection of mice against experimental cryptococcosis by anti-Cryptococcus neoformans monoclonal antibody. Infect. Immun. 55: 749-752. Mukherjee, S., L. Sunhee, J. Mukherjee, M. D. Scharff, A. Casadevall. 1994. Monoclonal antibodies to Cryptococcus neoformans capsular polysaccharide modify the course of intravenous infection in mice. Infect. Immun. 62: 1079-1088. Sanford, J. E., D. M. Lupan, A. M. Schlagetter, T. R. Kozel. 1990. Passive immunization against Cryptococcus neoformans with an isotype-switch family of monoclonal antibodies reactive with cryptococcal polysaccharide. Infect. Immun. 58: 1919-1923. Yuan, R. R., A. Casadevall, J. Oh, M. D. Scharff. 1997. T cells cooperate with passive antibody to modify Cryptococcus neoformans infection in mice. Proc. Natl. Acad. Sci. USA 94: 2483-2488. Yuan, R. R., G. Spira, J. Oh, M. Paizi, A. Casadevall, M. D. Scharff. 1998. Isotype switching increases efficacy of antibody protection against Cryptococcus neoformans infection in mice. Infect. Immun. 66: 1057-1062. Mukherjee, J., W. Cleare, A. Casadevall. 1995. Monoclonal antibody mediated capsular reactions (Quellung) in Cryptococcus neoformans. J. Immunol. Methods 184: 139-143. Yuan, R., A. Casadevall, G. Spira, M. D. Scharff. 1995. Isotype switching from IgG3 to IgG1 converts a nonprotective murine antibody to Cryptococcus neoformans into a protective antibody. J. Immunol. 154: 1810-1816. Mukherjee, J., M. D. Scharff, A. Casadevall. 1995. Variable efficacy of passive antibody administration against diverse Cryptococcus neoformans strains. Infect. Immun. 63: 3353-3359. Taborda, C. P., M. A. Juliano, R. Puccia, M. Franco, L. R. Travassos. 1998. Mapping of the T-cell epitope in the major 43-kilodalton glycoprotein of Paracoccidioides brasiliensis which induces a Th-1 response protective against fungal infection in BALB/c mice. Infect. Immun. 66: 786-793. Rivera, J., J. Mukherjee, L. M. Weiss, A. Casadevall. 2002. Antibody efficacy in murine pulmonary Cryptococcus neoformans infection: a role for nitric oxide. J. Immunol. 168: 3419-3427. Beenhouwer, D. O., S. Shapiro, M. Feldmesser, A. Casadevall, M. D. Scharff. 2001. Both Th1 and Th2 cytokines affect the ability of monoclonal antibodies to protect mice against Cryptococcus neoformans. Infect. Immun. 69: 6445-6455. Feldmesser, M., A. Mednick, A. Casadevall. 2002. Antibody-mediated protection in murine Cryptococcus neoformans infection is associated with pleotrophic effects on cytokine and leukocyte responses. Infect. Immun. 70: 1571-1580. Zuger, A., E. Louie, R. S. Holzman, M. S. Simberkoff, J. J. Rahal. 1998. Cryptococcal disease in patients with the acquired immunodeficiency syndrome. Ann. Intern. Med. 104: 234-240. Powderly, W. G.. 1996. Recent advances in the management of cryptococcal meningitis in patients with AIDS. Clin. Infect. Dis. 22:(Suppl. 2): S119-S123. Larsen, R. A., P. G. Pappas, J. Perfect, J. A. Aberg, A. Casadevall, G. A. Cloud, R. James, S. Filler, W. E. Dismukes. 2005. 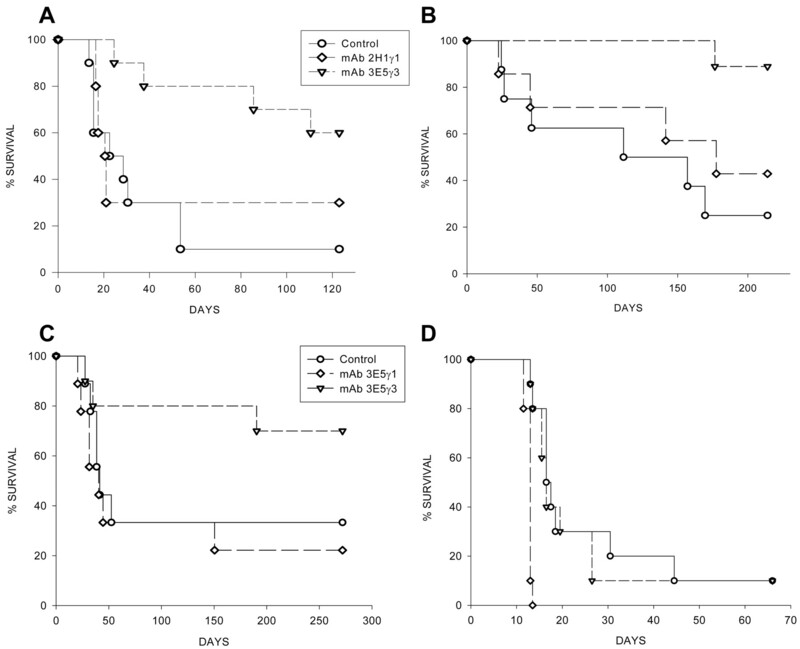 Phase I evaluation of the safety and pharmacokinetics of murine-derived anticryptococcal antibody 18B7 in subjects with treated cryptococcal meningitis. Antimicrob. Agents Chemother. 49: 952-958. Mukherjee, J., M. D. Scharff, A. Casadevall. 1992. Protective murine monoclonal antibodies to Cryptococcus neoformans. Infect. Immun. 60: 4534-4541. Mukherjee, J., L. Pirofski, M. D. Scharff, A. Casadevall. 1993. Antibody mediated protection in mice with lethal intracerebral Cryptococcus neoformans infection. Proc. Natl. Acad. Sci. USA 90: 3636-3640. Feldmesser, M., A. Casadevall. 1997. Effect of Serum IgG1 to Cryptococcus neoformans glucuronoxylomannan on murine pulmonary infection. J. Immunol. 158: 790-799. Briles, D. E., J. L. Claflin, K. Schroer, C. Forman. 1981. 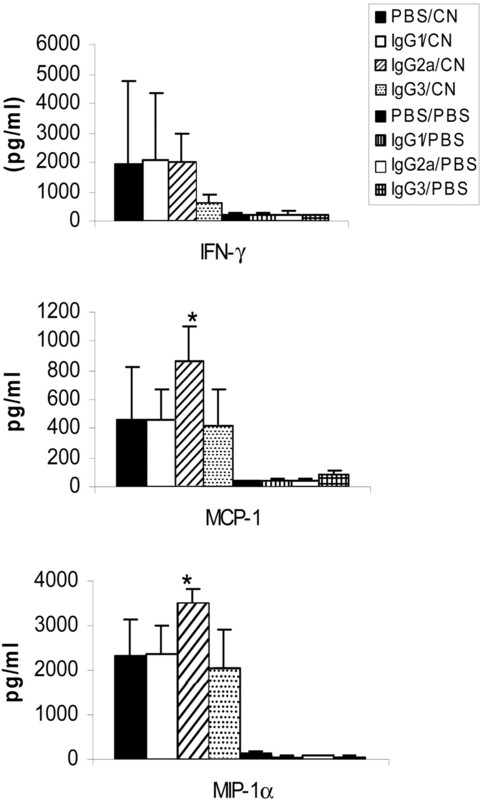 Mouse IgG3 antibodies are highly protective against infection with Streptococcus pneunomiae. Nature 294: 88-90. Torres, M., R. May, M. D. Scharff, A. Casadevall. 2005. Variable-region-identical antibodies differing in isotype demonstrate differences in fine specificity and idiotype. J. Immunol. 174: 2132-2142. Franzot, S. P., J. Mukherjee, R. Cherniak, L. Chen, J. S. Hamdan, A. Casadevall. 1998. Microevolution of a standard strain of Cryptococcus neoformans resulting in differences in virulence and other phenotypes. Infect. Immun. 66: 89-97. Cherniak, R., E. Reiss, S. H. Turner. 1982. A galactoxylomannan antigen of Cryptococcus neoformans serotype A. Carbohydr. Res. 103: 239-245. Granger, D. L., J. B. Hibbs, Jr, L. M. Broadnax. 1991. Urinary nitrate excretion in relation to murine macrophage activation: influence of dietary l-arginine and oral NG-monomethyl-l-arginine. J. Immunol. 146: 1294-1302. Taborda, C. P., J. Rivera, O. Zaragoza, A. Casadevall. 2003. More is not necessarily better: prozone-like effects in passive immunization with IgG. J. Immunol. 170: 3621-3630. Van der Pol, W. L., J. G. J. Van de Winkel. 1998. IgG receptor polymorphisms: risk factors for disease. Immunogenetics 48: 222-232. Rhodes, J. C., L. S. Wicker, W. J. Urba. 1980. Genetic control of susceptibility to Cryptococcus neoformans in mice. Infect. Immun. 29: 494-499. Huffnagle, G. B., N. E. Street, M. Lipscomb. 1992. In contrast to BALB/c mice, a Cryptococcus neoformans infection in C57BL/6 mice generates protective T-cell immunity in the periphery and non-protective T-cell mediated eosinophilia in the lungs. FASEB J. 6: A1689-A1693. Hoag, K. A., N. E. Street, G. B. Huffnagle, M. F. Lipscomb. 1995. Early cytokine production in pulmonary Cryptococcus neoformans infections distinguishes susceptible and resistant mice. Am. J. Respir. Cell Mol. Biol. 13: 487-495. Hoag, K. A., M. F. Lipscomb, A. A. Izzo, N. E. Street. 1997. IL-12 and IFN-γ are required for initiating the protective Th1 response to pulmonary cryptococcosis in resistant C.B-17 mice. Am. J. Respir. Cell Mol. Biol. 17: 733-739. Vecchiarelli, A.. 2000. Cytokines and costimulatory molecules: positive and negative regulation of the immune response to Cryptococcus neoformans. Arch. Immunol. Ther. Exp. 48: 465-472. Shapiro, S., D. O. Beenhouwer, M. Feldmesser, C. Taborda, M. C. Carroll, A. Casadevall, M. D. Scharff. 2002. IgG monoclonal antibodies to Cryptococcus neoformans protects mice deficient in complement component C3. Infect. Immun. 70: 2598-2604. Huffnagle, G. B., M. F. Lipscomb, J. A. Lovchik, K. A. Hoag, N. E. Street. 1994. The role of CD4+ and CD8+ T cells in the protective inflammatory response to a pulmonary cryptococcal infection. J. Leukocyte Biol. 55: 35-42. Feldmesser, M., Y. Kress, A. Casadevall. 1998. Effect of antibody to capsular polysaccharide on eosinophilic pneumonia in murine infection with Cryptococcus neoformans. J. Infect. Dis. 177: 1639-1646. Feldmesser, M., A. Casadevall, Y. Kress, G. Spira, A. Orlofsky. 1997. Eosinophil-Cryptococcus neoformans interactions in vivo and in vitro. Infect. Immun. 65: 1899-1907. Davis, W. B., G. A. Fells, X. Sun, J. E. Gadek, A. Venet, R. G. Crystal. 1984. Eosinophil-mediated injury to lung parenchymal cells and interstitial matrix: a possible role for eosinophils in chronic inflammatory disorders of the lower respiratory tract. J. Clin. Invest. 74: 269-278. Gleich, G. J., E. Frigas, K. A. Loegering, D. L. Wasson, D. Steinmuller. 1979. Cytotoxic properties of the eosinophil major basic protein. J. Immunol. 123: 2925-2927. Sampson, A. P.. 2000. The role of eosinophils and neutrophils in inflammation. Clin. Exp. Allergy 30: 22-27. Wu, W., M. K. Samoszuk, S. A. Comhair, M. J. Thomassen, C. F. Farver, R. A. Dweik, M. S. Kavuru, S. C. Erzurum, S. L. Hazen. 2000. Eosinophils generate brominating oxidants in allergen-induced asthma. J. Clin. Invest. 105: 1455-1463.
Cooper, L. J., J. C. Schimenti, D. D. Glass, N. S. Greenspan. 1991. H chain C domains influence the strength of binding of IgG for streptococcal group A carbohydrate. J. Immunol. 146: 2659-2663.
Cooper, L. J., A. R. Shikhman, D. D. Glass, D. Kangisser, M. W. Cunningham, N. S. Greenspan. 1993. Role of heavy chain constant domains in antibody-antigen interaction: apparent specificity differences among streptococcal IgG antibodies expressing identical variable domains. J. Immunol. 150: 2231-2242. Ravetch, J. V., J. P. Kinet. 1991. Fc receptors. Annu. Rev. Immunol. 9: 457-492. Daeron, M.. 1997. Fc receptor biology. Annu. Rev. Immunol. 15: 203-234. Hazenbos, W. L. W., I. A. F. M. Heijnen, D. Meyer, F. M. A. Hofhuis, C. Renardel de Lavalette, R. E. Schmidt, P. J. A. Capel, J. G. J. van de Winkel, J. E. Gessner, T. K. van den Berg, J. S. Verbeek. 1998. Murine IgG1 complexes trigger immune effector functions predominantly via FcγRIII (CD16). J. Immunol. 161: 3026-3032. Csaszar, A., T. Abel. 2001. Receptor polymorphisms and diseases. Eur. J. Pharmacol. 414: 9-22. Shimokawa, T., T. Tsuge, K. Okumura, C. Ra. 2000. Identification and characterization of the promoter for the gene encoding the human myeloid IgA Fc receptor (FcαR, CD89). Immunogenetics 51: 945-954. Hazenbos, W. L. W., J. E. Gessner, I. A. F. M. Heijnen, F. M. A. Hofhuis, H. Kuipers, D. Meyer, I. A. F. M. Heijnen, R. E. Schmidt, M. Sandor, P. J. A. Capel, et al 1996. Impaired IgG-dependent anaphylaxis and Arthus reaction in FcγRIII (CD16) deficient mice. Immunity 5: 181-188. Lovchik, J. A., C. R. Lyons, M. F. Lipscomb. 1995. A role for γ interferon-induced nitric oxide in pulmonary clearance of Cryptococcus neoformans. Am. J. Respir. Cell Mol. Biol. 13: 116-124. Huffnagle, G. B., R. M. Strieter, T. J. Standiford, R. A. McDonald, M. D. Burdick, S. L. Kunkel, G. B. Toews. 1995. The role of monocyte chemotactic protein-1 (MCP-1) in the recruitment of monocytes and CD4+ T cells during a pulmonary Cryptococcus neoformans infection. J. Immunol. 155: 4790-4797. Huffnagle, G. B., R. M. Strieter, L. K. McNeil, R. A. McDonald, M. D. Burdick, S. L. Kunkel, G. B. Toews. 1997. Macrophage inflammatory protein-1α (MIP-1α) is required for the efferent phase of pulmonary cell-mediated immunity to a Cryptococcus neoformans infection. J. Immunol. 159: 318-327. Vecchiarelli, A., C. Retini, C. Monari, A. Casadevall. 1998. Specific antibody to Cryptococcus neoformans alters human leukocyte cytokine synthesis and promotes T-cell proliferation. Infect. Immun. 66: 1244-1247. Kawakami, K., S. Kohno, J. Kadota, M. Tohyama, K. Teruya, N. Kudeken, A. Saito, K. Hara. 1995. T cell-dependent activation of macrophages and enhancement of their phagocytic activity in the lungs of mice inoculated with heat-killed Cryptococcus neoformans: involvement of IFN-γ and its protective effect against cryptococcal infection. Microbiol. Immunol. 39: 135-143. Huffnagle, G. B., M. F. Lipscomb. 1998. Cells and cytokines in pulmonary cryptococcosis. Res. Immunol. 149: 387-396. Liesenfeld, O., H. Kang, D. Park, T. A. Nguyen, C. V. Parkhe, H. Watanabe, T. Abo, A. Sher, J. S. Remington, Y. Suzuki. 1999. TNF-α, nitric oxide and IFN-γ are all critical for development of necrosis in the small intestine and early mortality in genetically susceptible mice infected perorally with Toxoplasma gondii. Parasite Immunol. 21: 365-376. Florquin, S., Z. Amraoui, C. Dubois, J. Decuyper, M. Goldman. 1994. The protective role of endogenously synthesized nitric oxide in staphylococcal enterotoxin B-induced shock in mice. J. Exp. Med. 180: 1153-1158. Florquin, S., M. Goldman. 1996. Immunoregulatory mechanisms of T-cell-dependent shock induced by a bacterial superantigen in mice. Infect. Immun. 64: 3443-3445. Feldmesser, M., A. Casadevall. 1998. Mechanism of action of antibody to capsular polysaccharide in Cryptococcus neoformans infection. Front. Biosci. 3: d136-d151. Mukherjee, J., G. Nussbaum, M. D. Scharff, A. Casadevall. 1995. Protective and nonprotective monoclonal antibodies to Cryptococcus neoformans originating from one B cell. J. Exp. Med. 181: 405-409. Mednick, A. J., M. Feldmesser, J. Rivera, A. Casadevall. 2003. Neutropenia alters lung cytokine production in mice and reduces their susceptibility to pulmonary cryptococcosis. Eur. J. Immunol. 33: 1744-1753. Tripp, C. S., K. P. Beckerman, E. R. Unanue. 1995. Immune complexes inhibit antimicrobial responses through interleukin-10 production: effects in severe combined immunodeficient mice during Listeria infection. J. Clin. Invest. 95: 1628-1634. Vecchiarelli, A., D. Pietrella, F. Bistoni, T. R. Kozel, A. Casadevall. 2002. Antibody to Cryptococcus neoformans capsular glucuronoxylomannan promotes expression of interleukin-12Rβ2 subunit on human T cells in vitro through effects mediated by antigen-presenting cells. Immunology 106: 267-272. Casadevall, A.. 2003. Antibody-mediated immunity against intracellular pathogens: two-dimensional thinking comes full circle. Infect. Immun. 71: 4225-4228. Eisenstein, T. K., B. M. Sultzer. 1983. Immunity to Salmonella infection. Adv. Exp. Med. Biol. 162: 261-296.